Following a flurry of weak economic readings over the last two months, several recent figures reiterate that another recession remains unlikely. A strong gain by a leading manufacturing index offered an encouraging trend this week, while consumer sentiment gained footing. Further, a promising drop in first-time jobless claims helped bolster confidence that unemployment will at least remain flat. Nonetheless, caution and uncertainty remains elevated as stock market volatility, yet flattened job growth and GDP trends have largely disappointed. Anticipating continued stagnation, the Fed launched “Operation Twist” to keep long-term Treasuries at record lows and to spur lending, a plan that could offer commercial real estate investors unique opportunities. U.S. GDP grew 1.3 percent in the second quarter led by contributions from nonresidential fixed investment, exports and federal government spending, though budget-strapped state and local governments remained a drag on growth. New claims for unemployment, meanwhile, dropped to 391,000, bringing the four-week moving average to 417,000. However, weekly jobless claims need to remain below 400,000 for an extended period to lower unemployment from 9.1 percent. 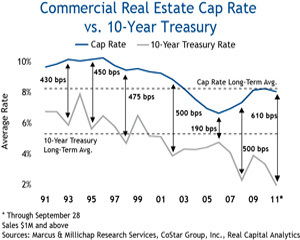 As Fed measures such as “Operation Twist” sustain downward pressure on the 10-year Treasury through 2013, investors with longer-term hold horizons will continue to deploy capital into commercial real estate. 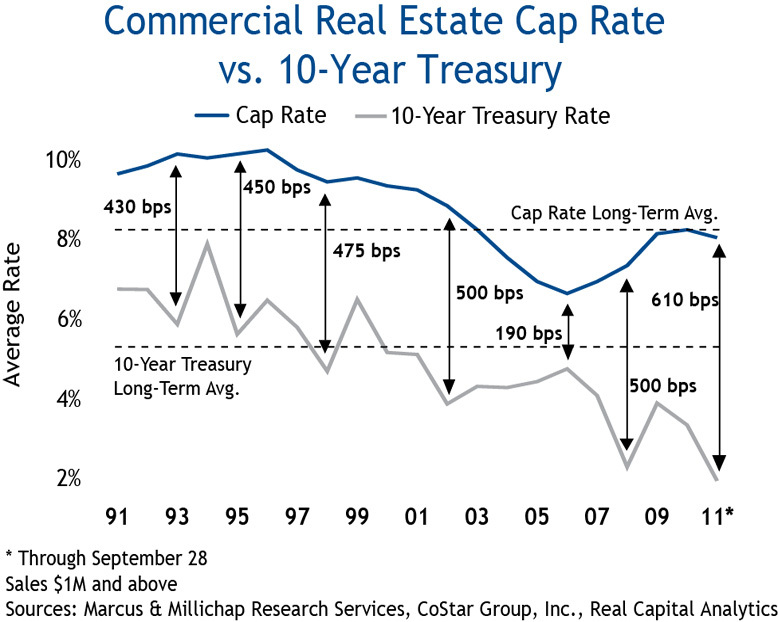 Despite recent price surges and cap rate recompression in top assets, overall commercial real estate cap rates averaged more than 600 basis points above the record-low 10-year Treasury at the close of the third quarter. This spread provides long-term investors with a buffer against limited NOI growth in the first few of years of pro forma, which will encourage modest risk tolerance. Though investors will continue to concentrate on best-in-class deals, many will pursue yields in B class properties in primary markets or top-tier properties in well-performing, secondary markets. Increased caution among prospective homebuyers, together with steep financing hurdles, will continue to slow home sales, a trend that will strengthen apartment operations. In addition, the apartment sector is benefiting from tight supply conditions; stock additions over the first two quarters of 2011 marked one of the lowest 6-month totals on record. As a result, U.S. apartment vacancy retreated below the 10-year annual average of 5.9 percent in the second quarter. Although more projects are starting to move forward, the supply/demand balance will remain favorable, with vacancy to close 2011 at 5.6 percent. Meager GDP growth and a slowdown in hiring will present challenges for the U.S. office market this year. Occupied stock rose for the third consecutive quarter during the April-June period, though net absorption of 1.2 million square feet was insufficient to reduce the U.S. vacancy rate, which held firm at 17.5 percent. Despite the national slowdown in absorption, demand growth in major metros such as Seattle, Washington, D.C., and Chicago continued to make headway. Assuming some level of sustainable job creation takes shape in the second half and business angst subsides, corporate expansions in major gateway cities will contribute to rising absorption, translating into vacancies in the low-17-percent range by year end. This entry was written by marcusmillichap, posted on October 1, 2011 at 12:48 am, filed under Research. Bookmark the permalink. Follow any comments here with the RSS feed for this post. Trackbacks are closed, but you can post a comment.